Set up your iPad Air for optimal use with an adjustable mount from The Joy Factory. 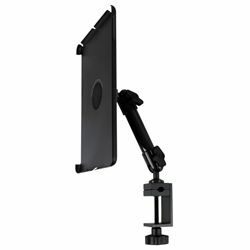 Constructed of high-quality carbon fiber arms and equipped with carefully designed joints, each of these mounts uses a MagConnect case system that's completely interchangeable... the magnet travels with the iPad Air so you can connect it instantly to any other MagConnect mount. The C-Clamp mount can attach to desk edges, shelves or tubing (like a music stand). Fits iPad Air.